Ogden on Politics: Did Bloomington South Display Bad Sportsmanship in 107-2 Defeat of Arlington? Did Bloomington South Display Bad Sportsmanship in 107-2 Defeat of Arlington? Bloomington South which, obviously, has a strong girl's basketball program defeated Arlington High School in Indianapolis 107-2 a few days. Arlington lost much of its students following a state takeover, including many of the players on its girls basketball team. At 500 students, Arlington has one of the worst Class A girls' basketball programs, while Bloomington South, a 4A School was one of the state's best. Arlington was clearly overmatched. Let me say from the outset that I don't agree the two teams shouldn't have played. Sports teaches important life lessons. One of those life lessons is that your opponent will often be bigger, stronger, and more talented. Sports teaches you to accept those challenges and learn from them, even in lopsided defeats. I also despise so-called "mercy rules" in sports. Life doesn't have mercy rules. Teaching kids to compete all the way through the end, even when the cause is hopeless, is part of life. Further, being "mercy ruled" is a bigger insult than losing by a large margin. You don't save face by having the game artificially called because your team is too far behind. This column though focuses on sportsmanship. Simply laying down and trying not to score is considered a grievous insult to the losing side. You are not supposed to do that. But there are certain unwritten rules of sportsmanship athletes are expected to follow when they are in a fortunate position of blowing out an opponent. These sportsmanship rules, which limit blowouts, are well known to most athletes...or at least I thought they were. FOOTBALL: The team that is ahead takes out its starters. They are to not to attempt passing plays, especially those down the field. They utilize running plays and try to run down as much of the play clock as they can when they have it. They don't pass up field goals and touchdowns, and they continue to try to get first downs, but they only do so in the context of a simple straight-forward defense. On defense, the superior team is certainly not to blitz. BASEBALL: The winning team doesn't try to stop getting runs or stop trying to get the other team out, which would be considered an insult to the inferior team. The superior team's players, however do not take the extra base and they do not steal. As with all sports, the superior team is supposed to put their weakest players in the game. BASKETBALL: The superior team is supposed to stop running and play half court offense, with the shot clock winding down before taking a shot. On defense, they are not to press but instead fall back into a relaxed defense such as loose zone that at the very least would let the inferior team have reasonably open outside shots. You can often look at box scores of games and see whether these unwritten sportsmanship rules were followed in lopsided games. Unfortunately my attempt to find statistics from the Bloomington South-Arlington game proved unsuccessful. The only thing I learned of signficance was that Arlington's two points came on free throws, one in the second quarter and one in the third. I don't know how many field goals were attempted versus how many made, I don't know how many free throws were shot, I don't know how many steals there were or how many turnovers. So unfortunately I don't know if Bloomington South was still running fast breaks against an outmatched opponent. I don't know if the team was taking quick shots and not running down the clock. I don't know if Bloomington South was pressing Arlington, which would show up as an unusually high number of turnovers and/or steals. My guess, considering the 107-2 score, is that Bloomington South had to be violating the unwritten sportsmanship rules. A girl's high school basketball game is only 32 minutes or 1,920 seconds long. With a 35 second shot clock, that is a minimum of 55 shots. At two points a basket (assuming no three pointers), that is 110 points. That very generous analysis assumes Bloomington South had the ball 100% of the time and hit every one of the shots it took, which obviously didn't happen. Bloomington South simply couldn't have gotten to 107 points without running against an overmatched team and pressuring Arlington's offense into turnovers, long after it was clear Bloomington South would easily triumph. I don't see any other conclusion but that Bloomington South's coach displayed bad sportsmanship in having her players deliberately run up the score. When I was ten years old, I personally witnessed another blow out. Madison High School, the school I would eventually attend, was playing Switzerland County in boy's basketball. Madison, the bigger school, usually dominated the smaller Switzerland County. Thiatyear was no exception. When the final buzzer sounded, Madison won 142-44. * How did we get to 142 points? Madison ran, threw full court passes, and constantly employed a full court press against an opponent that struggled to brig the ball up the court. For a young kid, it was a lot of fun looking for Madison blowing out its opponent by what I hoped would be 100 points. But now as an adult looking back, Madison displayed really poor sportsmanship that night and the lopsided victory was not something of which to be proud. *The website Hickory Husker lists the 142 point game as tied for the third highest total in an Indiana high school basketball game. It fails, however, to list the 98 point margin of victory as one of the highest. I believe my memory on the margin in that Madison Switzerland County game is correct as I believe I saw the score reprinted in later years. Note: If anyone can find the box score of the game, I'd love to see it. I tend to agree, but I think the analysis is a little wobbly. It is my understanding that generally no matter what the score is a team plays the first half full out. The halftime score in this game was apparently 65-1. In the 16 minutes remaining, South scored 42 points (21 made shots). That equates to about a bucket every 46 seconds (assuming no three-pointers). As you point out, a team is expected not to press, but is expected to play solid half-court defense without fouling. In light of that, it is likely that Arlington committed a fair number of turnovers, which would have reduced their time with the ball, tipping the equation in South's favor. I'm not sure that a bucket every 46 seconds demands the conclusion that there was anything unsportsmanlike going on. Most of those shots, given the talent disparity, were probably layups. I forgot the point that one of those sportsmanship rules is that you're not supposed to foul on defense if your the superior team. Contest the shots, but let them have them. Looking at the defensive side, I don't know how Arlington could have gone the entire game without making a field goal, if BS was laying back on defense as they're supposed to be doing. Just dumb luck even the worst players would have a shot go in if allowed to shoot by an opponent. My analysis would be a kot better if I had stats from the game. Of course, your analysis is just on made field goals. (Not sure where you got that statistic. Obviously they took more shots than they made. So they were shooting the ball more than every 46 seconds in the second half. We also don't know if they were shooting 3 pointers which would also be a big no-no with that kind of lead. I was just going on the fact that they scored 42 points, which would require 21 made shots in the second half. I am assuming they were not shooting threes. The point that I was getting at is if they are shooting layups - a very good possibility, as they are playing against a VERY poor defense - they are going to be shooting a VERY high percentage. In that case, they probably didn't have many missed shots (so they wouldn't have had to take many more than 21 shots in the second half). I would love to see what their overall shooting percentage was (I'm betting 80%+) and would really like to see the box score broken down by halves. Yeah, my guess is they didn't miss a whole lot of shots. Play hard the whole game regardless of the score. Anything is else is patronizing, degrading nonsense. No one is degraded by an opponent playing hard all the time. I've been on the receiving end of beatdowns; we deserved it because we sucked. 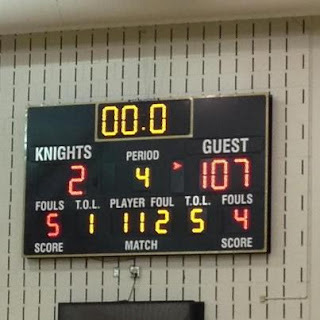 We got full-court pressed by the first team, the second team and the third team (and this was intramural basketball!) and we couldn't do anything at all. Looking back, it is pretty hilarious to think how bad we were. We had no idea how to break a press or advance the ball against pressure. I still don't know how we ever scored at all. I think the final score was something like 55-6, but that was 30+ years ago and the memories fade.